The fog has a noticeable heft to it. Dense, heavy, gray air that sits tantalizingly out of range of your fingertips. If you could reach out and collect it in a jar, you’d then put that jar on a shelf and forever remind yourself of the English countryside. That’s where you have to go to find one of the greatest celebrations in the name of all things automotive. That fog does lift eventually, of course. It yields to the spectacular. Welcome to Goodwood. Welcome to the Festival of Speed. Welcome to Heaven. Over the course of a few days in June, some of the greatest cars on the planet assemble in one location while 150,000 gasoline-loving folks come to stare, cheer, clap, and maybe even cry a little. Also attending are some of the greatest names in motorsports; from past and current F1 stars, insane pilots of two-wheeled rocketships, rallying heroes, and even drifters, truck drivers, actual celebrities, and the occasional well-connected automotive journalist or two. All are suiting up, donning a helmet, and cueing up to make a run at the tight, twisting tarmac measuring 1.16 miles long and packing in nine surprisingly difficult turns before you can breathe easy and back off the throttle. You see exemplary cars, trucks, and bikes from a vast range of categories that span across the decades. Your vehicle have to have provenance and it has to be invited. Vintage Formula One masterpieces mingle with Pre-War race cars that most closely resemble the automotive equivalent of a glorious way to die. The Beast of Turin, which is essentially an Industrial Age furnace on wheels, burps fire at the start line while a parade of the latest supercars head back to their separate paddock. Adam Carolla tinkers with his Paul Newman-raced Nissan 300ZX in one spot while Vaughn Gittin Jr. talks about his day in the next. Before I experienced all of that for the first time, I had a hard time understanding why people speak of Goodwood with such wonder. I had an even harder time explaining to friends and family why I packed for a 10-hour flight across the United States and the Atlantic Ocean in one shot to take in the car party unfolding on Lord March’s lawn. So let’s back up a second. Where the hell is Goodwood, who’s Lord March, and why does he turn his (massive) front yard into what is arguably one of the greatest garden parties on the planet? I understand, on a basic level, why I pay attention to the featured marques, the drivers making appearances, and the latest supercars slated to run up the hill. It’s because I like loud engines, skilled racing drivers, and any celebration that puts the automobiles at the forefront. But I need to learn more about the who, what, where, and why of it all. And those are the questions I’m going to try to answer for the folks who don’t understand and for the car guys and gals that pretend they do. As a clueless American automotive enthusiast, it’s easy to view Goodwood simply as Britain’s answer to Pebble Beach, just be another excuse for the well-heeled to break out their brightly colored pants and mingle around bottomless glasses of champagne as cars sit quietly in the background. This isn’t the case, and your lesson on all things Festival of Speed has to start with a bit of history. Goodwood is an estate located in West Sussex, and it sits on a large plot of land located just over 60 miles from London. The Goodwood Estate occupies around 12,000 acres of English countryside. Grass hills in a shade of green I never see living in California fly off in every direction with the occasional dotting of trees and hedgerows before ending as the southerly land falls into the English Channel. I mean, there’s definitely some champagne and fanciness to be had if you want it. Back at the estate, you’ll find horse racing tracks, two golf courses, a farm, an airport with a grass runway and a flying school, a fancy hotel, the Goodwood House itself, and both the Goodwood Circuit and Hillclimb. Oh, and in 2003 Rolls-Royce decided to open a new headquarters on the estate grounds. The rolling green of the English countryside in West Sussex seems to be the perfect spot for the extra bit of inspiration put into each stitch of (numerous) dead cow lining the interior of the latest Dawn or Wraith. The man in charge of all of this goes by the name Charles Gordon-Lennox. He’s the Earl of March and Kinrara Deputy Lieutenant. Today, those fancy titles mean that Charles is the son of nobility but his title no longer carries actual power. Regardless, he’s better known, at least to those who love racing, as Lord March. What you’ll care about most is his love of horsepower. Lord March enjoys seeing all sorts of cars drive as fast as possible while on his race track and driveway hillclimb course. He also happens to be President of the British Automobile Racing Club. Back in the late 1940s, Lord March’s grandfather decided to open the Goodwood Motor Circuit. Sir Stirling Moss competed and won one of the first events at the circuit, which would hold a Formula One race, numerous sports car races, and even a nine-hour endurance race over the course of its 2.367 miles and seven turns. Racing on the circuit came to an end in 1966. Testing, however, would continue. In fact, the Goodwood Circuit is where Bruce McLaren had his tragic fatal accident on June 2, 1970 in a McLaren M8D. Racing at the circuit came back to life when Lord March took over the family estate in early 1990s. His father moved out, and Lord March moved his family into the massive Goodwood House. With Lord March now fully in charge, it was time to bring motorsports back to the estate. This is how the Goodwood Revival came to be back in 1998. 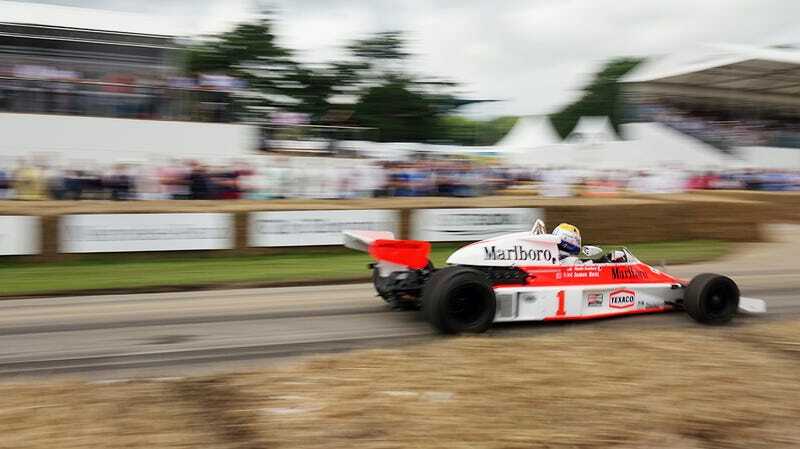 It’s the Festival of Speed though, which first kicked off in 1993, that brought racing back to the Goodwood Estate. There, Mark Higgins is on hand to show you his purpose-built Subaru WRX STI Isle of Man TT rally car, while Jason Plato is parked right next to him in a Subaru Levorg BTCC prepping for his run. Keanu Reeves is on hand to run up the hill in the motorcycle he’s shilling, the Arch KRGT-1. Nico Rosberg shows up to do one-handed donuts in a 2008 Mercedes W05. Nick Mason looks perfectly at home behind the wheel of an absolutely bonkers Auto Union Type C race car from the 1930’s, fitted with a unique dually rear-wheel setup. Porsche preps its Le Mans winning 919 for a few runs, yes the one that a week prior took the victory when the Toyota entry failed with three minutes left in the race. Oh, and that Toyota is here too (and yes, it’s sad to look at). There’s a dash of Group B, a smattering of Group C, and a handful of GT3. I’ve just briefly described to you just a mere fraction of what makes the Festival of Speed so amazing. I didn’t mention Ben “The Stig” Collins whipping the new Raptor up the hill, or seeing NASCAR cars and trucks far out of their element but doing amazingly well. Mike Skinner blew the crowd away when he crushed the hill in his Toyota Tundra en route to the 3rd fastest time of the weekend. It’s the crowd part that was rather astonishing though, as when you attend your average motorsports event or high-end car show, you typically have little access to the people and the machines. It’s the exact opposite at Goodwood. This level of access isn’t just for those who pay for the most expensive tickets or for spoiled automotive journalists. Once you’re past the entry gates, you can walk up to Duncan Pittaway and chat with him while you’re both leaning against the Beast of Turin. Go ahead and ask Scott Pruett for a photo and then peek your head in one of the many Lexus vehicles he drove up the hill. If you have a question about the Aston Martin DB11 you’re standing next to, you can ask Andy Palmer about it because he’s there in his racing suit ready to give the car a dash across the Goodwood estate. Beyond the access to man, woman, and machine, the festival goers themselves are friendly even if they forgot to bring their Wellies. There’s tasty food, good-enough beer, plenty of delicious champagne, and everyone around you seems happy to be out in the countryside for the weekend. For 2016, Goodwood decided to honor the success of BMW in motorsports throughout the decades. Starting in 1997, the central display has become an homage to a set automaker for a given year. Artist Gerry Judah is responsible for creating the massive display that serves to put an automaker right in front of the Goodwood House. I saw folks craning their neck to the sky to take in the sight of special cars soaring high about their head. A BMW 328 Mille Miglia roadster, Brabham-BMW BT52, and BMW V12 LMP hung in the air, almost appearing an attempted escape from that early morning fog before basking in the warm afternoon sun on the final day of the festival. Beyond that bit of static BMW artwork, there was moving artwork also paying its respects to the history of BMW on the racetrack. Lord March himself opened the festival by driving a perfect 507 up the hill. Throughout the weekend, BMW was represented by everything from its classic racing bikes to a range of touring cars, a Procar M1, and on up to the BMW Motorsports McLaren F1. These cars aren’t driven gingerly up the hill, mind you. While you leave with your photos and your memories of the odor of tires hard at work mixed with racing fuel, it’s the furious noise that will stick in your brain long after you’ve left. A Honda RA300 races past at full song while you stand 30 yards past the outside of the turn, protected only by bales of hay and a few wooden fence posts. Some lucky soul pilots the McLaren M26 of James Hunt and he’s not letting off the throttle Soon after, one of Senna’s Lotus-Renault 97T cars also makes the dash and it looks downright stunning with its John Player Special livery. The pre-war machines are the most exciting tractors you’ve ever heard, and you’ll be only mildly surprised to learn that the Le Mans GTE-winning Ford GT doesn’t sound as good as the original Ford GT40 running a few seconds prior. It’s the combination of the sights and sounds mingling with the smells and the access. This is Pebble Beach made better. You can be honest here and say that you don’t actually care or remember what vehicle won the Concours d’Elegance last year, or the last 10 years. You care about seeing purpose built cars do the activity for which they were designed. Throttle pedals receive the workout they crave, and they get it rain or shine. It’s England, so it’s going to be both. Despite everything I’ve just told you, there’s still more. That’s part of the beauty and wonder of the Goodwood Festival of Speed. I wasn’t able to make it into the Forest Rally Stage to capture the sight of the Colin McRae-raced Subaru Impreza 555 or Walter Röhrl-raced Lancia Rallye 037 in all its Martini-liveried glory. I can tell you though, that seeing a Kamaz Dakar Rally truck in full drift on the hill climb stage is a sight I’ll never forget. Lord March doesn’t celebrate his automotive love affair with just one event either. Over the course of three days in September, the Revival entertains with a specific era of machinery. The Goodwood Racing Circuit comes alive with vehicles built and raced between the years 1948 and 1966. Many consider this the golden age of motorsports, and it’s hard to argue that when you get to see Ferrari and Shelby race cars battle on the track. The entire event goes down with those in attendance making the effort to dress in period correct clothes. It’s throwback party to a fantastic time, with no modern cars or trucks allowed inside the perimeter of the circuit for the entire weekend. In addition to the Revival and the Festival of Speed, Lord March has also created the Member’s Meeting. This serves as a sort of combination of the two events, which will see more modern vehicles on the racing circuit while still welcoming the vintage race cars as well. The Member’s Meeting carries on the tradition of opening the historic racing season while also looking back and honoring the past racing circuit club meetings of the past. Additionally, the Member’s Meeting caps its attendance number at a much smaller amount in an effort to have some semblance of safety as the much faster cars are driven around the circuit. The Goodwood Festival of Speed is a celebration of everything we hold dear in our hearts with respect to our shared passion. It’s the type of loud that makes your pulse quicken. Racing fuel wafts into your nasal cavity and causes you to smile. People are happy because they’re surrounded by history, the present, and the future of the automobile and motorsports all in one beautiful place. You want to go here. No, you need to go here. The ticket to enter will cost* you around $42. If you want to get into the Grandstand seating, you’ll need to pony up another $50. There’s a combination pass that gets you both in one shot, if you don’t want to buy the two separately. Additionally, if you feel like going big, you can buy a number of hospitality passes that start around $470. This is where the food and booze starts flowing. You don’t need to drop that much coin though, and there are a number of tasty food and drink spots out on the grounds. There was even a cart selling Moscow Mule popsicles. You can fly into Heathrow and then drive the hour and a half or so South to Goodwood. Once there, you can sleep in your car, book a camping spot, or try and book a room in the Goodwood Hotel. If you’re going to camp, you’ll be spending anywhere from $220 to $800 for your spot depending on what fits your needs and budget. This ranges from a basic camping plot to a pre-setup tent equipped with mobile charging spots, air beds, and a seating area. Rooms at the Goodwood Hotel start at around $470. Whatever route you go, you can create a Goodwood experience that fits within your budget. It won’t be cheap, either way, but it will be worth it. I can promise you that much. So plan ahead. Save your money. Book your flight and a hotel or a camping spot, and go. Go to the Goodwood Festival of Speed, because you belong there. This is your home, and Lord March is holding the door open for you. Jeff Glucker is the co-founder and executive editor of Hooniverse.com. He’s often seen blowing oil smoke in the faces of others as he drives his 1965 Ford F100 around Southern California.